When it comes to raising actual human beings, there’s so much that one has to consider. I sometimes feel as if I would make a pretty good policeman, yo! I mean, I basically police what they eat, who they play with and what they watch on TV. I investigate every bump and scratch on their bodies. I even check and double check to make sure the toys they are playing with are kid friendly and safe. I take their “toy-playing” very seriously, you guys! Toys, like the Mega Bloks Treehouse Adventures, that provide an educational benefit is a must! A clever parent (me.. I’m talking about me…) will sneakily use playtime as opportunity for their child to learn. The best type of toys are the ones that engage senses, encourage interaction and spark imagination. The Mega Bloks Treehouse Adventures from Fisher Price helps with this! This 120-piece play set includes colorful building blocks and special parts such as a moving swing and a window that really opens. The easy-to-build tree house and cottage, with woodland decoration, makes for a complex construction site for little minds. I love watching the wheels in Kari’s head turn as she puts it together. Her favorite part is when she gets to sit the 2 Block Buddy’s on top of her creation. I’ve probably seen 50 variations of her tree house design and yes, that means 50 over emphasized “wows” as I pretend to be utterly amazed at her sheer brilliance. The Mega Bloks Treehouse Adventures is ideal for kiddies aged 1 to 5, but clearly our little boetie also wanted in on the action. I totally appreciate that the pieces are not hazardous or a choking risk. 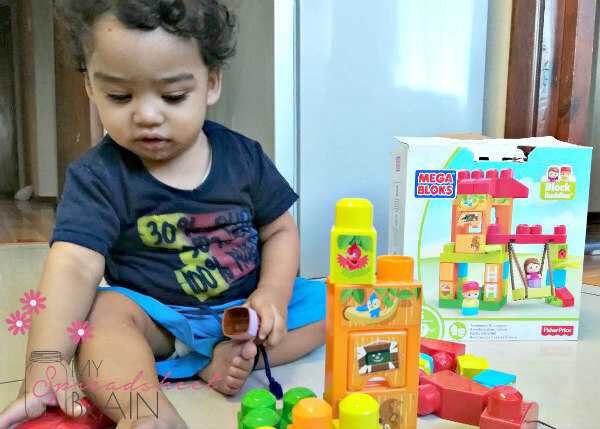 Do your kids enjoy playing with blocks as much as mine do?